Public Institution Kaunas religious music center ( KRMC ) was established in 2001. Its initiator and leader – Master of Church Music , organist Dalia Jatautaitė . The ultimate goal – the development of classical music and promotion . Kaunas Religious Music Centre – various musical events , concerts in Kaunas County , Lithuania regions. A large part of the world of classical masterpieces only sacral environment takes proper sound. Great masters of the baroque and classical compositions performed in the church vault reaches the listener somewhat differently than in concert halls. Classical music performed by professional musicians , KRMC organized events available to everyone – concert program shall be awarded to audience demand, cultural knowledge, the events are free . KRMC projects involve artists from both Lithuania and foreign countries. Kaunas religious music center ( KRMC ) initiative supported by the Lithuanian Ministry of Culture, Cultural Foundation , Kaunas City Municipality , LLC ” Organum ,” the press house ArxBaltica , private donors , and sponsors from abroad. Thanks to them, the center has accumulated a substantial library of instrumental , vocal , choral literature , various periodicals. Kaunas religious music center has a movable mechanical organ ( positives) , which provides an opportunity to expand the geography of the concert organization . Many Lithuanian church organ in the state is very poor. Acquisition of movable organ has opened access to the most remote corners of Lithuania with various music programs . Kaunas Old Town in the Jesuit church is not only a religious but also cultural attraction . It organizes various events and the most important city of the country and preparing feasts of the church community , the Jesuit Gymnasium of Kaunas city youth and beyond. Because the church is open to all , it finds refuge church several formal community organizations, who held employment action , organized training for future and young families , and other educational events . In addition, the broad and the Jesuit church in secular activities . Jesuit church provides many opportunities for anyone wanting to learn communication, access to religious worship traditions , studying cultural treasures and cherish them . Jesuit church of the Jesuit high school graduates celebrations, holidays and other students’ activities . 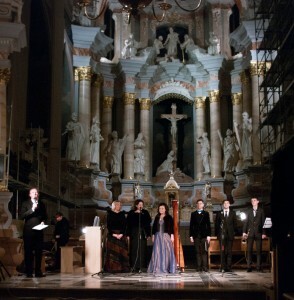 One of the most important Jesuit church of secular and cultural activities of the initiative – it is from 2001, the Jesuit church of operating public institution of religious music in the center of Kaunas . The center was established in the then Lithuanian Jesuit Provincial of the Province and its priest Anthony Shaulite thanks . Kaunas religious music center is one of the most active not only in Kaunas community , but also the country’s musical heritage and fosters cultural operators. The main activities of the organization – the organization of cultural events for the local community and visitors to the city as well as educational projects for young people. For 12 years in this church regularly performed cultural events , it is – a variety of professional artists’ projects , such as . : Project ” Sunday Music ” , the international festival ” Musica Sacra” . The last festival featuring national , and even more – artists from around the world. The organization and the Jesuit church prides close cooperation relationship with Graz (Graz , Austria) , Bratislava (Slovakia ) , Warsaw ( Poland ), Antwerp ( Belgium ) , Sandefjord ( Norway ), and other cultural organizations and individual professional musicians. International cultural exchange is a very positive community interest in promoting the culture of the other factor . Moreover , usually after each event , participants of the festival kindly communicate with concert goers . If it is possible to discussions , the festival discussions with both ordinary listeners and music with students and school pupils. Kaunas religious music events center is partially funded Kaunas city municipality and the Ministry of Culture . Copyright © 2019 Kaunas religious music center	All Rights Reserved.